Certain alien hunters have long held the belief that the moon is actually hollow, and is an alien spacecraft which is monitoring Earth. 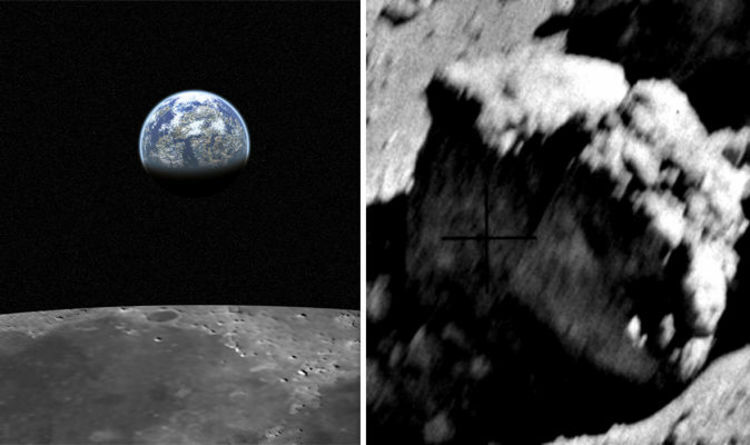 Now, these people believe they have the Holy Grail of proof after finding what they think is a statue on the lunar surface. An image from the Apollo 16 mission – which happened in 1972 – shows what looks like a head made from rock on the floor. This has led to the conclusion that it was left there by an alien race. Prominent UFO hunter Scott C Waring was the first discover the supposed statue head, and believes it proves the moon is actually a giant spaceship. Writing on his blog, UFO Sightings Daily, Mr Waring wrote: “The face looks human in appearance. It is laying on its right cheek, with big bushy hair, small jaw, nose, eyes and forehead. “It appears to have been a head off of a giant statue. “I and many others UFO researchers believe the Earth’s moon to be a giant spaceship, covered in sand and dirt to hide its metallic outer surface. Meanwhile, others would argue there is a more logical explanation for the supposed head-shaped rock. Sceptics and NASA would say the statue head and other similar findings are just the effects of pareidolia – a psychological phenomenon when the brain tricks the eyes into seeing familiar objects or shapes in patterns or textures such as a rock surface. This would mean the supposed statue head could just be a misshapen rock.